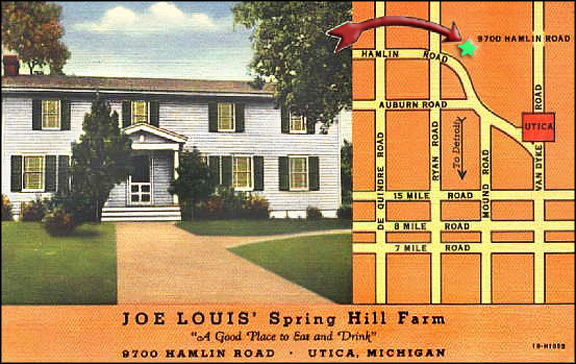 In the late 1930s, world heavyweight boxer Joe Louis bought Springhill Farm, about 250 acres of present day River Bends Park, from Charles Weeks for $100,000. The transaction, handled by Louis’manager John Roxborough, was completed the week of August 18th,1939, according to the old weekly Utica Sentinel. Joe Louis was a horse lover, so it was natural for Roxborough to make the Spring Hill Farm into a riding stable. Many changes were made. The tool shed and the cattle barn were converted into horse stables. All the floors of the stalls for the horses had a clay base to protect their hooves. Of course, the clay had to be hauled in as the farm was a sandy loam. A track was built at the bottom of the hill for horse shows. Bleachers were built at the bottom of the hill and box seats were built on the south end of the track. According to Jim and Jack Brede, sons of Herman Brede, there were two rooms in the basement on the east side of the house. They were dingy and damp and the timbers were rotting. There was also a tunnel by these two rooms leading to the north of the house in the side of the hill. These were the rooms used by the runaway slaves in their quest for freedom in Canada, via Port Huron. The house was renovated and made into a restaurant. A large room was added on to the north side of the house. The restaurant became a fine eating place for many citizens of the area. Also, since Joe Louis was the owner, many people of the black race would patronize it. The property was lost due to Louis’ financial difficulties. On December 1, 1944, the state Conservation Department bought 409 acres, including the old Springhill Farm which became part of the Utica-Rochester Recreation Area. The remaining 18 acres of the original farm, including the buildings, changed hands several times. Owners were Romann Halanski, William H. Jamens, and Arthur J. Hill. Hill was the owner when the building burned down in 1973. The entire parcel was leased to the goverment on April 20, 1954. The army established and maintained a Nike Missle Site until 1964 when it was turned over to the National Guard. Ten years later the DNR regained control. The buildings have long disappeared, except for a few foundation stones and the remains of several flower gardens. The “Spring in the Hill” still flows and the water is still as pure as when Uncle Peter Lerich first tasted it.